Those who want their Bollywood music to have a dash of the 1990s will lap up the Junooniyat album with glee, writes Aelina Kapoor. When it is a T-Series film, especially one belonging to the romantic genre, you expect a horde of composers, lyricists and singers coming together for at least half a dozen songs. This happened recently with Sarbjit and, before that, with Sanam Re and Airlift. 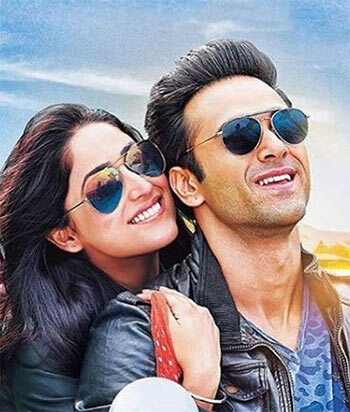 It is the same with Junooniyat, which sees Pulkit Samrat and Yami Gautam pair up again. It is a different matter that they had finished shooting for Junooniyat before Sanam Re, which released first. As is the trend with quite a few films currently, a yesteryear chartbuster is rehashed for Junooniyat. This time around, it is Stereo Nation's Nachange saari raat that finds favour, courtesy Meet Bros Anjjan who, along with lyricist Kumaar, bring it back in a new avatar. And such is the recall power of this super charged up dance number that you like hearing it all over again. While Neeraj Sridhar is the central performer here, he gets good support from Tulsi Kumar and Meet Bros. But what catches your attention more is the love soaked number Mujhko barsaat bana lo. This is a number that many a young Bollywood star would love to include in their film. Jeet Gannguli spins good magic with his composition and comes up with a melodious number that is written quite effectively by Rashmi Virag. Armaan Malik's vocals are the icing on the cake. Ankit Tiwari follows up nicely with his composition, Ishqe di lat. The song, rendered by Ankit and Tulsi Kumar, has an old world charm. Manoj Muntashir's lyrics are appropriate for the kind of lovelorn mood director Vivek Agnihotri wants to introduce through the music. Falak Shabir has unique vocals and you wonder why he isn't heard more often when you hear him in the title track. A beautiful song put together by Meet Bros Anjjan and Kumaar, it is paced well, orchestrated appropriately, arranged nicely and makes a good impression for those who like their Bollywood music soaked in love. An attempt is made by Meet Bros Anjjan to bringin some masti and mazaa through Pagalon sa naach. While the pace is just right for this energetic track that has a north Indian setting, the kind of impact that songs belonging to the genre -- Dhating naach (Phata Poster Nikhla Hero) or One two three four (Chennai Express) --- have is missing. This passable track by Kumaar is sung by Meet Bros and Khushboo Grewal. The album concludes with Tu junooniyat (climax song) which is yet another wonderful number by Jeet Gannguli. He does well with both his songs as he brings his experience into play. The song has a good start, courtesy the passionate manner in which Shrey Singhal sings. It maintains a good pace right through and, with Akriti Kakar coming on the scene (she reminds you of Anuradha Paudwal), you do want to hear this Manoj Muntashir song all over again. Those who want their Bollywood music to have a dash of the 1990s will lap up the Junooniyat album with glee.